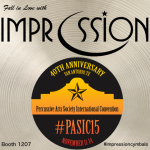 We take pride in producing our cymbals to meet the highest acoustical and aesthetic standards. 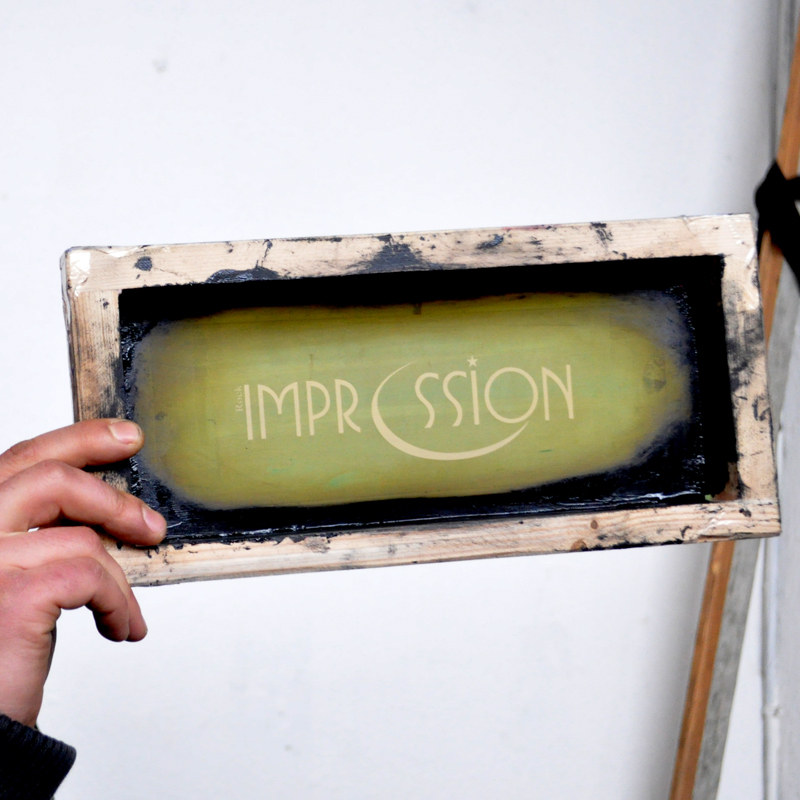 Our manufacturing process is not a secret, even though we have learned a trick or two to better the centuries old trade and enhance the end result’s grade. 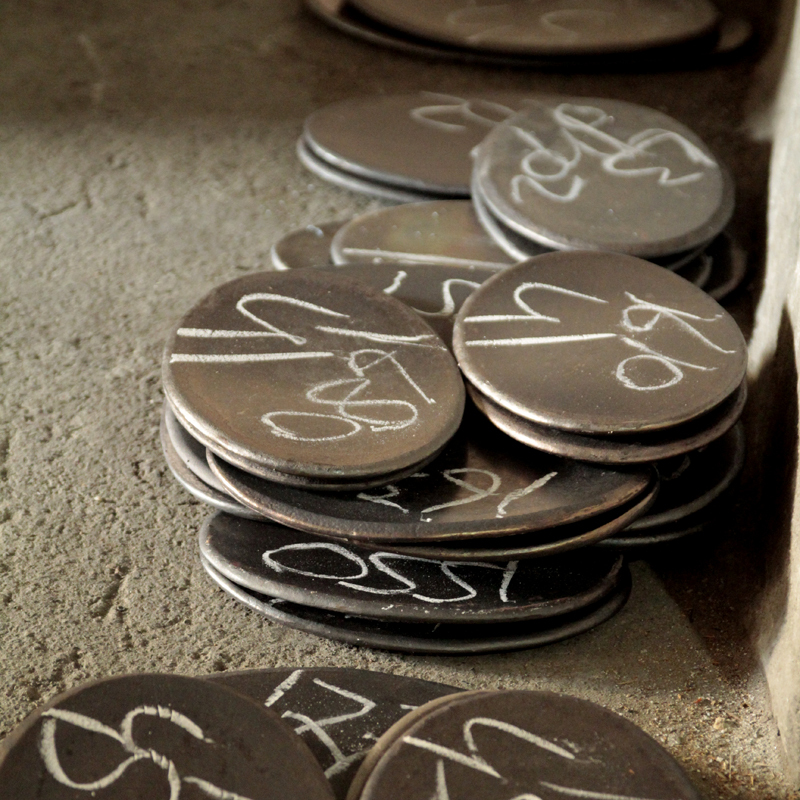 It is simply a thoroughly manual craft implemented by master artisans. 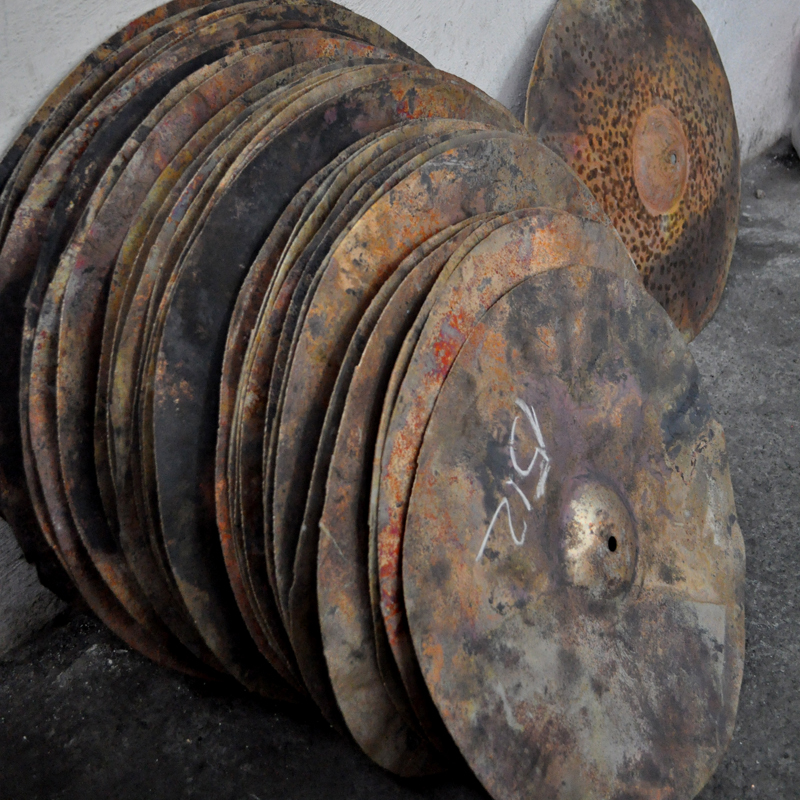 In essence, cymbal profile, weight, and the molecular structure of the bronze alloy are the three most important factors for the cymbal characteristics, and this trio forms the basis of our quality. 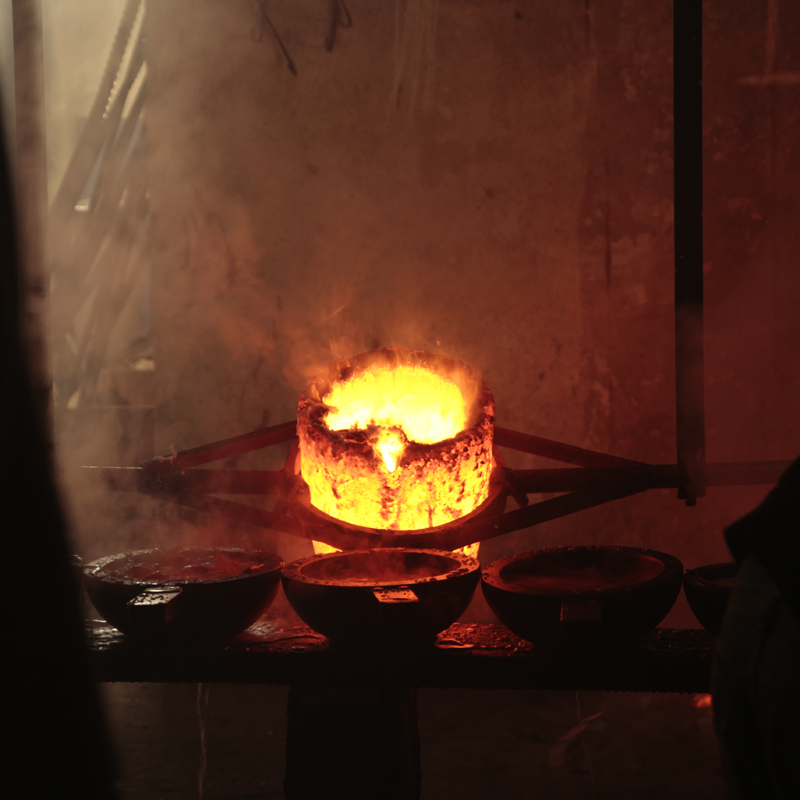 As we are making instruments that produce sound by vibrating, the target of the casting process is to make the copper and tin mixture to behave as close to the elements’ ideal mechanical properties as possible. We melt our special B20 formula in max. 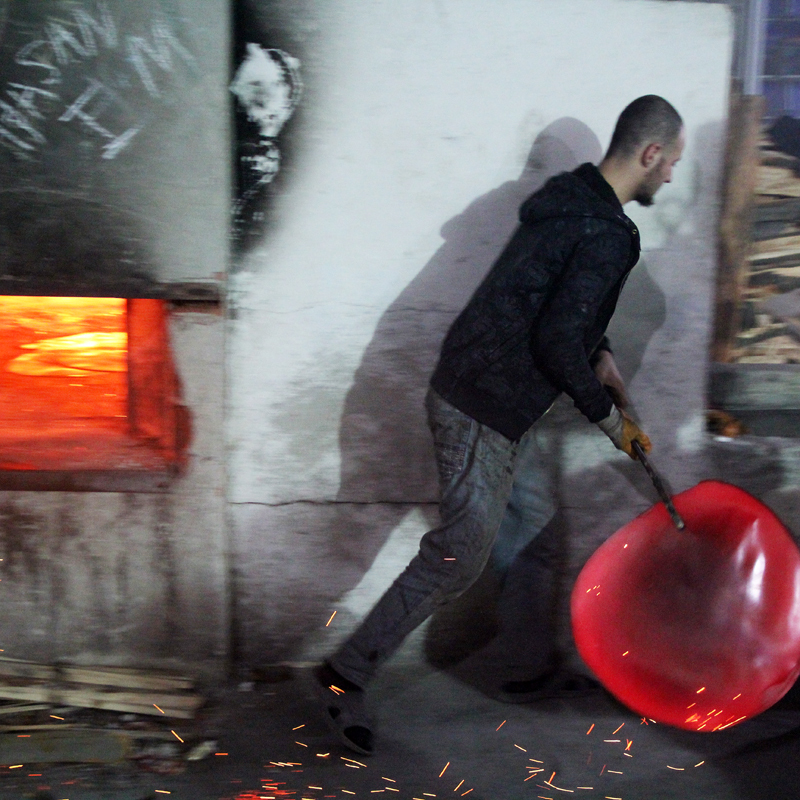 50kg pots with very precise measurements using coal fire. 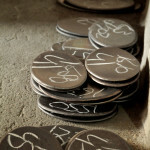 This way, the cast bronze that goes into our slow burning wood oven obtains carbon for much-needed elasticity. 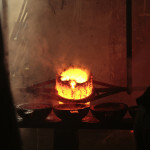 The molten metal is then poured to molds in order to produce basic cymbals blanks in various sizes. The cast blanks are repeatedly run through our rolling machine and re-heated. 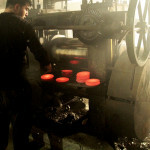 This process is repeated until the aimed size and thickness is reached. 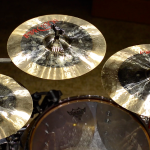 At that point the the cymbals are shocked in a pool of water at the highest temperature possible. 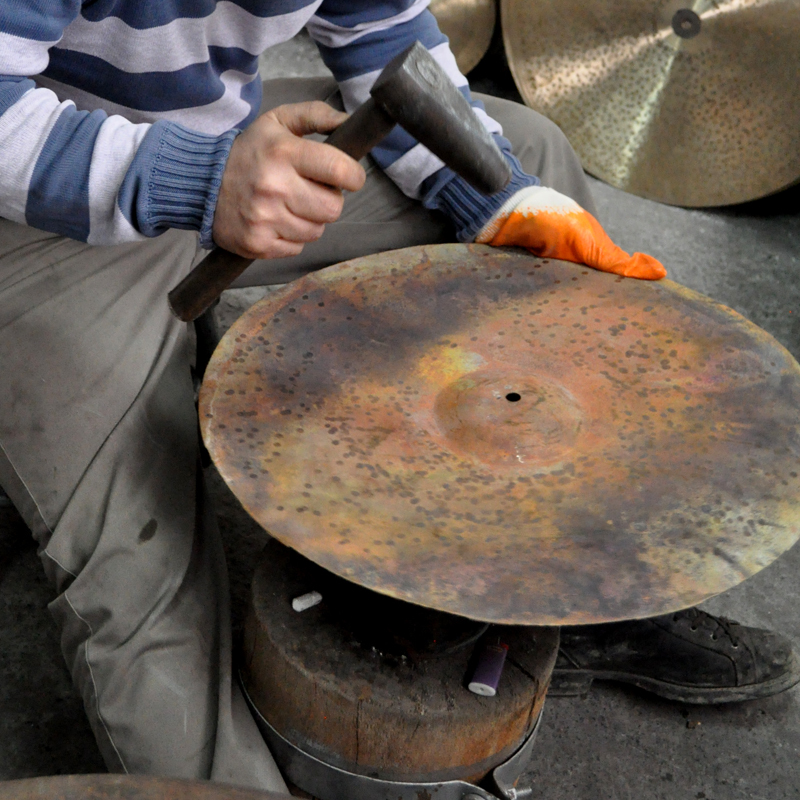 Even though shocking a cymbal at a high temperature causes it to be very out of shape, we have learned over time that this is the best way to achieve the most successful end result and best quality bronze. However, this also makes the hammering process more difficult and time-consuming. 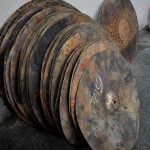 In our industry it is very common to shock the cymbal blanks at low temperatures in order to speed up the manufacturing process and make them suitable for press machines, despite its tendency to drastically lower the cymbal material’s acoustic quality. 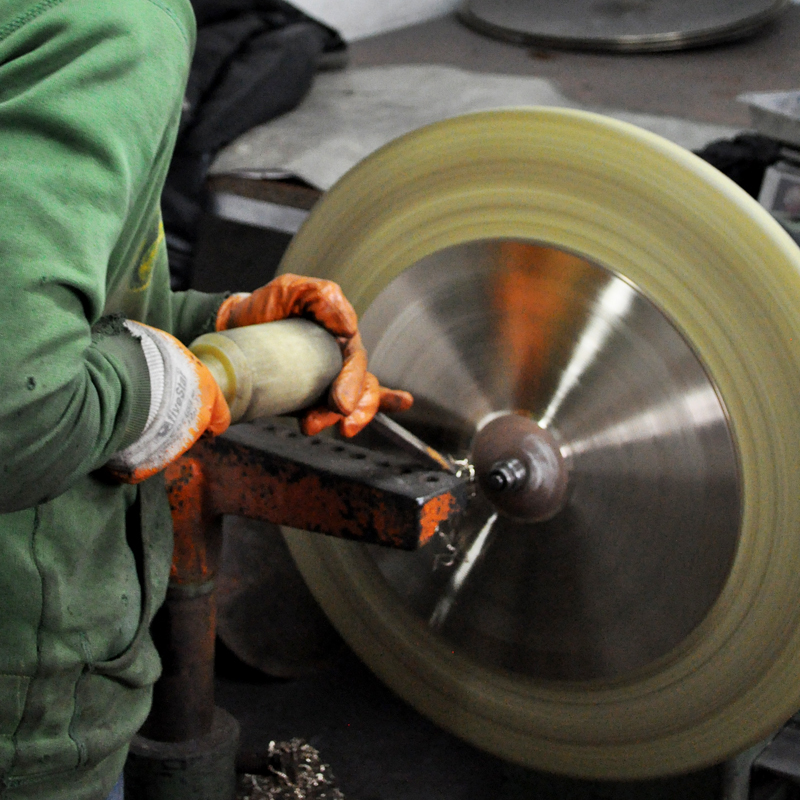 All our cymbals are hammered and all hammering is done by hand, with different profiles (bow, edges) applied to each size and cymbal model. 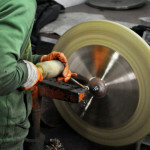 We hammer and test the cymbals over and over before sending the cymbals for lathing. If the cymbal is not a lathed model, it is simply finished after the last heating and hammering process. In some cases, lathed cymbals are hammered and/or heated again in repeated cycles. Considering the bell, its size and the pressure it is applying to the center of the cymbal, we can easily say that it plays a big role in the final sound of the cymbal. In accordance with the profile and weight of the cymbal, the bell is heavily influencing its sound character and sustain. In light of this information, we work with a variety of 34 different bell sizes and profiles in order to be prepared to find the exact combination that produces the sound we are after. All our lathed models are lathed by hand, using various different lathing edges and patterns for achieving the aimed end result. 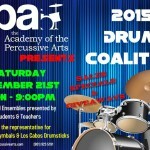 At this point, the final weight of the cymbal can still be altered radically. 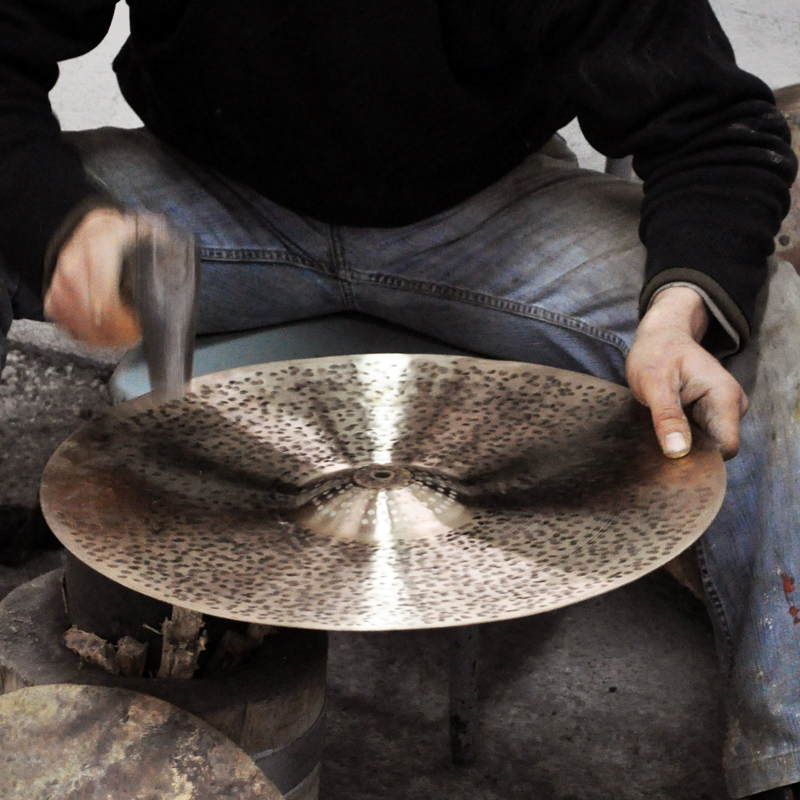 Lathing also heats the cymbal up, affecting its structure and sound in multiple ways. 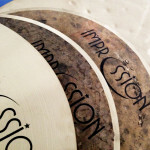 Other finishing methods that we subject the cymbal to include polishing and sandpapering. Again, both of these heat the cymbal and therefore affect not just the cymbal look, but its sound, too. 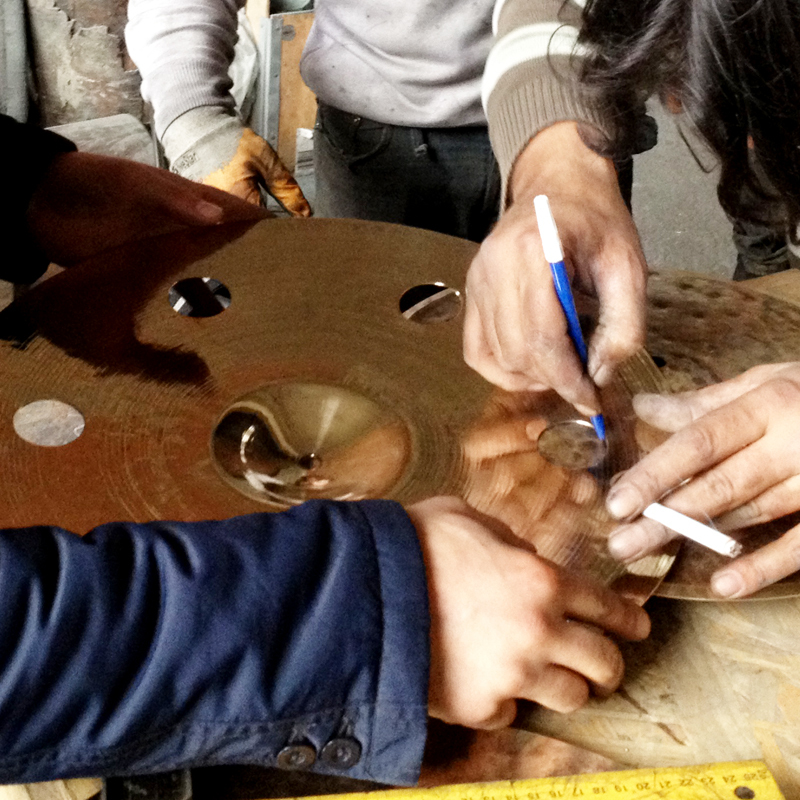 Any effect or rivet holes are drilled and smoothed after the cymbal has been finished. 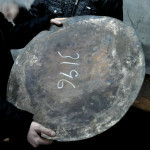 Large holes result not just in noticeable weight loss, but also effect the resonant qualities of the cymbal. Lastly, tested and approved cymbals are weighed, stamped, painted with Impression Cymbals logo and cleaned to be shipped in pristine condition to our customers.